Product #55633 | SKU 31310475100 (US) | 0.0 (no ratings yet) Thanks for your rating! Genius GX gaming introduces Scorpion, a high-quality gaming experience with gaming peripherals for Beginners all the way to Expert. 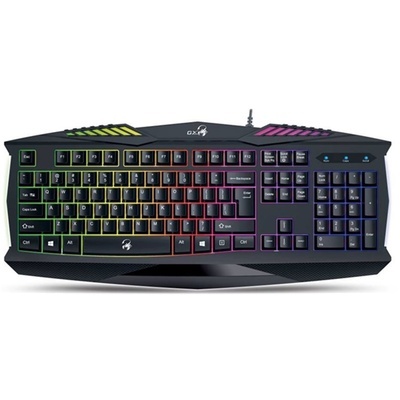 Scorpion K220 gaming keys are raised up half the height of a regular keypad with soft hands-on texture and wrist rests. Built to endure up to 2 million keystrokes, it vastly improves the gaming experience for newcomers. K220 features solid construction with rugged keycap and spill-resistant design. Optional rainbow backlight adds dimension to the experience, a great choice for an entry-level gamer.